America: the super power, the democratic dominant, and not to mention, the catalyst of global change, however, women aren’t even mentioned in its governing documents and have had the right to vote for less than 100 years. 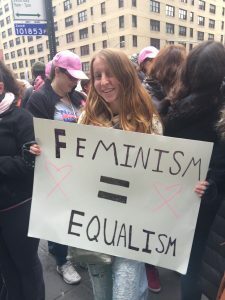 The news continues to discuss the evolution of women in America: the quintessential feminist and the growing support behind women in the work place, but what has definitely evolved while it has also remained stagnant. Being a woman in America revolves around the struggle of global privilege with a struggle to evolve. Looking at the international sphere, women in America have obtained rights: rights to an education, freedoms, more safety and liberties that are granted to any women in most other countries, specifically in more impoverished places, and we women of America understand that notion and are thankful for it everyday— well at least I know I am. I know that everyday I thank my lucky stars I have the ability to sit in a classroom; I have the potential to go out, and not only start a family, but begin a successful career. But that doesn’t mean being a woman in America is by any means easy or full of privilege. It simply describes the struggle of being in a place with so many opportunities and not enough hours in a day or energy to fight every battle. Or rather, plenty of opportunity, but a lack of means to actually achieve much of the high places men have been able to obtain. Women here are expected to juggle the life of a career and a family, and a happy husband, and if all points aren’t up to “American” standards, you’re questioned, often looked down upon for not being able to do it all. But most distinctly, looked down upon by other women. Women of America today illustrate modern super heroes: not your typical Marvel comic. Women keep their problems to themselves and drive harder and harder to get the job done at home and in the workplace: no complaints or whining, the job is simply to keep every plate spinning, everyone smiling, and exceed expectations in all you do to keep the phrase “like a girl” a thing of the juvenile past. American women today amplify a progression in quicksand. Directly adhering to the expectations of tomorrow by accomplishing the impossible, however, sinking to girl-on-girl hate and low level tactics of climbing the corporate ladder. Yet, it seems as though women have started to inhibit each other in this expanding of expectations: holding each other back, rather than bringing each other forward. Competition. That’s the culprit. And not only the competitive nature of females, but the lack of “we” and more of an emphasis on “I” in most scenarios. Feminists of today have put an emphasis on several issues women of our nation face today, primarily in reproductive health and resources. The advocacy for female rights here in the United States are miles ahead of most countries, but that doesn’t diminish the importance of the issues Women of America are facing today. Most importantly, women of the USA have yet the break the glass ceiling on a number of issues, whether its having a female president or only 5% of all Fortune 500 CEOs, the exemplars just have yet to arise. But, it’s not a matter of if, it’s a matter of when.